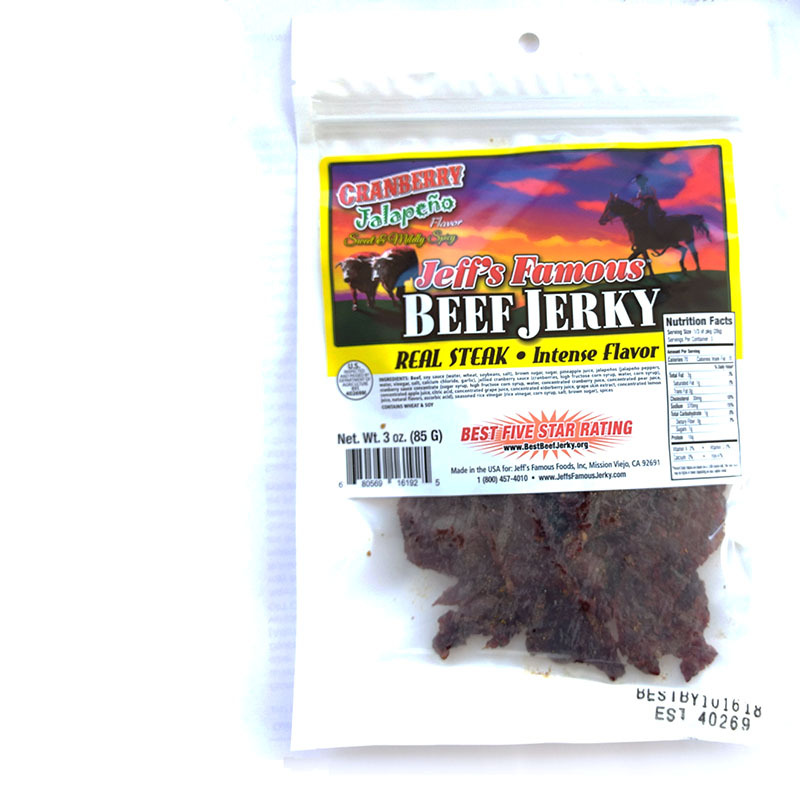 The newest flavor from Jeff's Famous Beef Jerky is this Cranberry Jalapeno. See previous reviews of Jeff's Famous here. Jeff's Famous Jerky, which previously was branded as "Jeff's Gourmet Jerky", is led by Jeff Richards of Mission Viejo, CA. Jeff has been making beef jerky since the 1970s. His love for cooking took him into the restaurant business for over 20 years. In 2006 he started working on creating his own beef jerky brand, and just last year saw the launch of his new company. This new Cranberry Jalapeno variety is described as having a refreshing taste of cranberry that blends with a subtle jalapeno flavor and mild heat. The first thing I taste from the surface of these pieces is a lot of sweet, slightly fruity flavor. Saltiness comes in at a moderate level, and a light meaty flavor. There's a touch of jalapeno flavor noticeable. The chewing flavor starts with a slightly heavier sweet, along with a touch of heat. There's a slight bit more of a natural meat flavor, and there's some spices noticeable. There's faint bit of cranberry flavor that lingers in the background. As for being described as a cranberry jalapeno variety, this seems to hold up. I can pick up a light cranberry flavor in the background, along with a touch of tart tanginess. The jalapeno flavor is also only lightly noticeable with a light touch of heat. 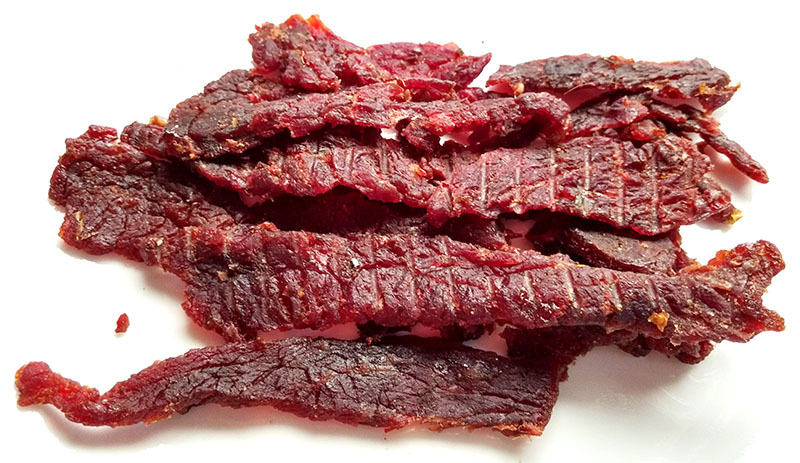 Otherwise, this jerky is largely defined by its heavy sweetness, along with a moderate level of natural meat flavors, and a light spiciness plus heat. The tangy and spicy flavors of cranberry and jalapeno flavors mostly add touches of interest to the sweet and meat. As for the heat, it's not that particularly hot. I'd rate it as "medium" (level 3 out of 5) for general consumers, and "mild" (level 1 out of 5) for chile heads. The natural meat flavors have a taste comparable to a grilled steak that's been sprinkled with seasoning. These are slices of whole meat, sliced into strips varying from 3 to 8 inches long, and sliced to a medium thickness. This is a semi-moist jerky, with a semi-moist, slightly sticky, surface feel. These strips are soft, and very flexible. It's easy to bite off chunks, and chewing is very easy. The chewing texture starts off feeling soft and tender with little chewing resistance. It chews down into a soft mass quickly and easily. At that point, it has a steak-like feel, but more soft, and not necessarily mushy. Most of these strips have noticeable streaks of fat, mostly as marbilized fat. I don't see any tendon or gristle, I do get some stringiness. Some of that stringiness remains in my mouth as unchewable wads of tissue. As for clean eating, my fingers pick up a slight stickiness, but not enough to require a licking and wiping before touching my keyboard. Jeff's Gourmet Jerky sells this Cranberry Jalapeno variety from it's website at a price of $39.95 for a 6 pack, with each package at 3oz. Add to that shipping of $12.20, and it works out to a price of $2.90 per ounce. For general jerky snacking purposes, at the $2.90 per ounce price, it's a good value. I get a lot of snackability for an excellent overall flavor, good meat consistency and good chewing texture. That price is a lot higher than what you pay for the major brands of jerky in grocery stores, but it's a much better flavor and meat consistency. As for a Cranberry Jalapeno variety, at the same $2.90 per ounce price, it's a weak value. It actually doesn't have that much cranberry or jalapeno flavor, only light amounts. Considering that $2.90 per ounce is getting into the high price range, you don't get a lot of those flavors for the buck. This Cranberry Jalapeno variety from Jeff's Famous Jerky offers a similar flavor found in Jeff's original variety, but with a little less spiciness, and a little more sweet. The cranberry and jalapeno flavors are noticeable, but light, offering just a touch of tangy, fruity and spiciness to an otherwise, sweetened, natural meat flavor. An Autumn campfire in the desert, where you take the family out for dirtbiking on a Thanksgiving weekend perhaps makes a great backdrop for this jerky. Cranberries evoke that sense of fall harvest and coming together. 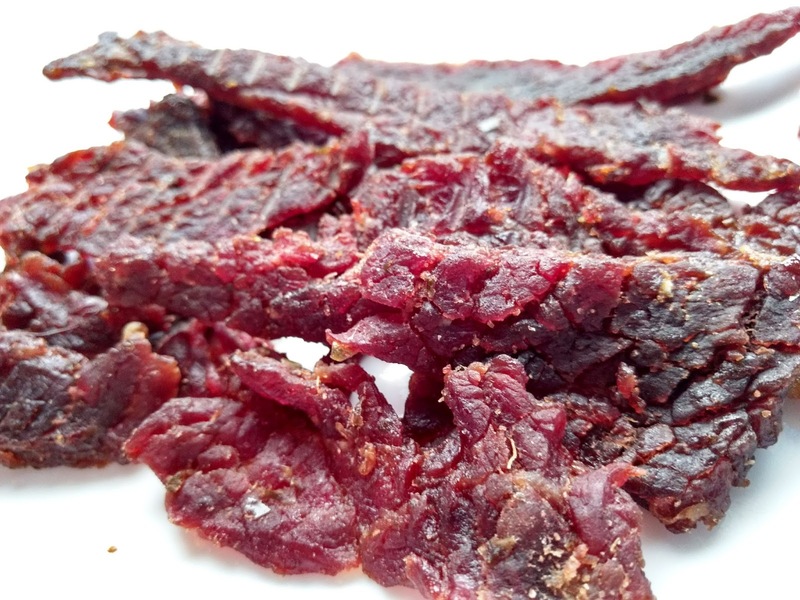 Otherwise, this jerky shares a lot of the same great qualities of other Jeff's Famous Jerky varieties in that it has a lot of natural meat flavors, easy to eat, and a good balance of sweet, spicy, and saltiness. My recommended beer pairing for this, go with an unflavored American-style hefeweizen, should bring out the subtle fruit flavors in this.